The Greenhouse is filled to the roof with plants and flowers. 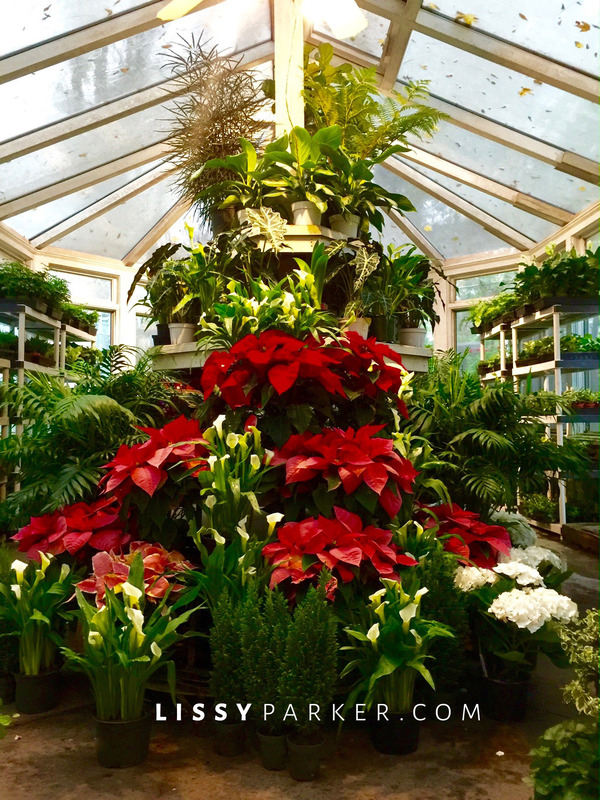 Boxwoods in Atlanta is the Christmas shopping stop you must make this holiday season! The shop is filled to the roof with plants, gifts, decorations, clothes, handbags, candles—there is even a new children’s clothes section in the new building. This lovely came home with me for Christmas. Love this miniature sleigh and reindeer. Red, white and a little gold shimmer would be nice. Choose orchids from the large selection and have it potted up. Silver, white and gold fill the blue room and this stunning tree. Silver and white set this tree aglow. White bows and snowflakes adorn this shimmering tree. Under the tree white and silver bowls hold even more ornaments to fill your tree. Santa peeks from behind the tree or your entry door. Santa’s reindeer is not far away. These trees will just make you smile. There are trees in every size for every home. Tiny elves hide in the green branches—ready to surprise your little ones. If you need a bow they have them ready to go in all shapes and sizes. I am crazy about these colorful ornament wreaths. check out these wreaths made from vintage ornaments. These ornament trees would look great on any table or mantle. Everyone needs a few charming house and woodland ornaments—and this cute tree garland. Rustic trees are illuminated with a little shimmer and shine. Table top trees and lanterns help with your decorating needs. How about a few ideas for your porch or garden. I had two of these mirrors in the Atlanta kitchen—sadly had to leave them. How about a tree with a beach theme. Need magnolia garland—they have miles of it. Thank you so much for allowing your readers to see the Christmas Magic of Boxwoods! I live out of state but when in Atlanta Boxwoods is a destination shopping stop.I would love for you do do other posts by category of this store so that those of us who are out of state could Make purchases online.Thanks again, and have a Blessesd Christmas! Susan, just zoom in on the pictures and call them. I do it all of the time! That Boxwoods has always intrigued me. It looks like so much fun! I could get into a lot of trouble there. Cindy, If you ever visit Atlanta you should make a special trip to Boxwoods. They are also one of the top 100 vendors in America—no small task! Boxwoods is by far my favorite Atlanta shop.